Rhyme time theme scheme. Six theme answers, four acrosses and two downs, they all end with the same sound – \āz\ – but each is spelled differently. 17a. [“Theme From Shaft” composer, 1971] ISAAC HAYES. It one the Best Original Song Oscar, and was in that context notable for a number of historical firsts. 25a. [Part of a project just before the end] FINAL PHASE. Not the strongest or most exhilarating of answers. 53a. [Condiment that can remove crayon marks] MAYONNAISE. This ostensible practicality does not elevate the evil substance’s value, in my opinion. 66a. [Intense look] STEELY GAZE. Eh. 11d. [Team in “Moneyball”] OAKLAND A’S. Really covering all the bases, including that unusual spelling. 33d. [The Fonz’s sitcom] HAPPY DAYS. Guess that explains why the grid is so full of “Ayyyyys,” wouldn’t you say? With all that theme material, you wouldn’t expect there to be room for lengthy or flashy fill, but you’d be wrong. With the themers swirling near the perimeter, the center of the grid is underused, and that’s where four seven-letter entries, emanating from the compass points, meet. We get BAYONET, PULSATE, WAITERS, and STATURE; not too shabby. Nothing much to report from the rest of the grid; more or less typical Monday fare. 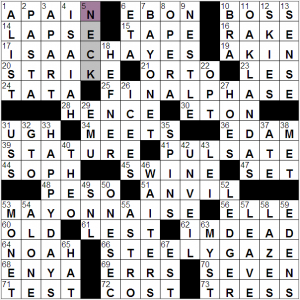 Some cross-referenced entries in: the connecting 1-across to 5-down for A PAIN | in the | NECK, then there’s 8d [“Der Rosenkavalier,” for one] OPERA, cited in 38d [N.Y.C. presenter of 8-Down, with “the”] MET. Least favorite partial: 21a OR TO, as in [“For here ___ go?”]. 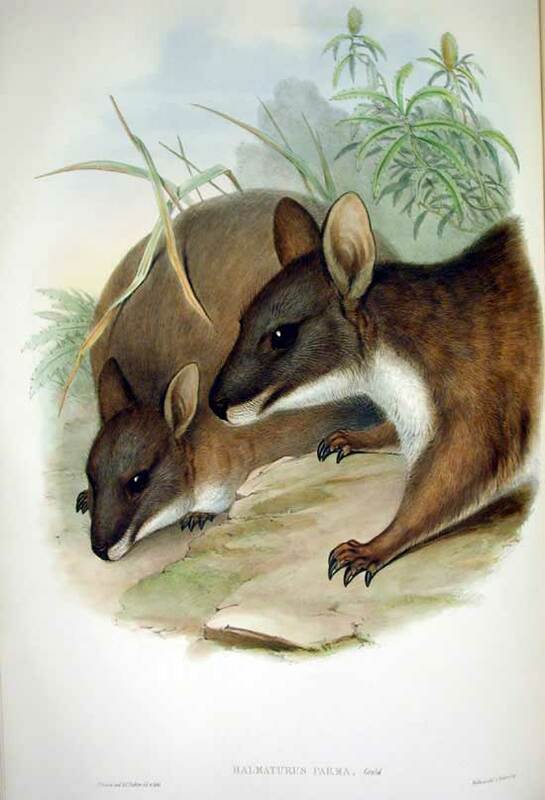 Without exception, staid and workmanlike, no-nonsense early-week clues. 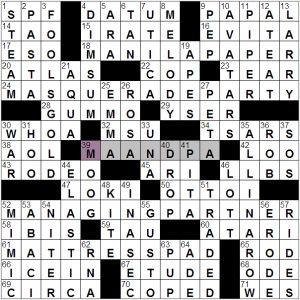 Easy Monday theme, as circumscribed (in the middle, but never mind that) by 39-across [The Kettles, or a hint to the answers to starred clues] MA AND PA. And we see two-word phrases whose components begin with MA— and PA—. 18a. [*File folder material] MANILA PAPER. 24a. [*Halloween bash with costumes] MASQUERADE PARTY. 52a. [*Law firm bigwig] MANAGING PARTNER. Managing, practicing …sounds as if they should be more competent. 61a. [*Foam bedding item] MATTRESS PAD. Five themers, two of them spanning the full width of the grid. 59 squares. Quite a lot of such material for an early-week offering, though admittedly the revealer is slight—in length only. And the ballast fill isn’t skimpy in recompense. Chewy longer items are ELASTIC | FOOL’S GOLD, AVATARS | ALL IN A ROW. Chewy shorter items include DIM SUM, PASTA and GUMMO Marx. Which isn’t to say the solving experience without some stress—it isn’t like a visit to a massage parlor or a stroll in MacArthur Park, you know. For instance, there are some unpretty inclusions and formulations: SPF at 1a, OTTO I, the dyed-in-the-wool crosswordese YSER, ARI and ARA together, TAU and TAO, ADE, and last and least, LLBS [Barristers’ degs.]. 11d PIPER is clued as [Peter, the pickled-pepper picker], though perhaps this is the moment for the au courant Orange is the New Black citation. It’ll undoubtedly show up in a crossword soon enough. Tripped over: 9a [Like a visit from Francis] PAPAL (Pope stuff isn’t foremost in my mind), and in the same corner 12d [Dined in] ATE AT (had trouble parsing the clue as intended (presuming no diabolical deliberate misdirection) and letting go of the duplicate ATE IN. [“The Shawshank Redemption” setting] clues PRISON CELL – I had “camp” before “cell.” In retrospect, it’s hard to make something out of a camp. [Disposable cosmetic remover] is FACIAL TISSUE – a lot nicer to think about makeup than its more typical use. [Instrument heard in the Beach Boys’ “Good Vibrations”] clues a HAMMOND ORGAN – let’s give a listen and see if we can pick it out. [Casting practice] is STAR SYSTEM – with so many types of “systems” out there, I wonder why this (relatively obscure IMHO) one was chosen. So I suppose in a bit from Young Frankenstein, we’re supposed to use these components to build a body? System seems a bit of the odd-man-out, as it would be a group of components (e.g, the digestive system consists of multiple cells and organs), but obviously tissues and organs are also made up of cells. Perhaps the idea is that each is a building block for the next one on the list? (Cell is the most atomic and system being the most complex?) Anyway, pretty heady stuff for a daily puzzle! As far as the grid itself goes, it’s a J short of a pangram unless I’m missing it on a cursory view. This made it pretty scrabbly with the Q of EQUAL SIGN and AQUA, the Z of ZAPATA and ZETA (the latter, clued as [Catherine ___-Jones], now separated from Michael Douglas I believe) and the X shared by AXE and EXERT. I’ll award my FAVE today to the colloquial I’LL GET IT, clued as [“Let me answer the door”]. DONEE as [Charity beneficiary] is probably a word I would never use outside of crossword grids, so I’ll give that my UNFAVE award today. This is #586 at brendanemmettquigley.com. I reckon I’ve done over 500 of them. Maybe around 550? Good stuff. If you’ve also done hundreds and hundreds of free BEQ puzzles and have never tipped their maker, you might consider hopping over to BEQ headquarters and clicking the “Tip yr. constructor!” link. You don’t get the bonus puzzle for tipping unless the pledge drive is going on, but you do help maintain this lovely resource as well as letting Brendan know you appreciate his labors. 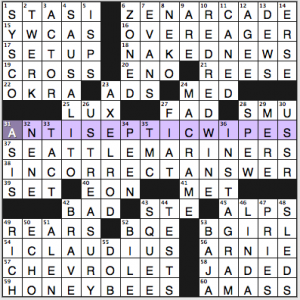 I don’t think the clue for 15-Across is accurate. 15a: YWCAS is clued [Community rec ctrs. ], but while you can go hang out and shoot hoops at the YMCA, the YWCA isn’t merely a female alternative to the YMCA (which does serve women too). The YWCA website’s locator map lets you find YWCA offices, not rec centers. The organization’s mission statement is “YWCA is dedicated to eliminating racism, empowering women and promoting peace, justice, freedom and dignity for all.” The YMCA is all about nurturing kids’ development, promoting health (the sports and exercise programs), and being socially responsible. 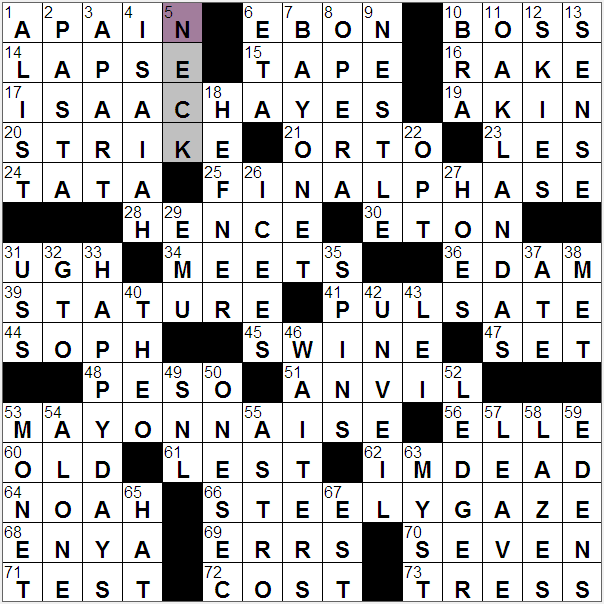 The puzzle’s got one triple stack of 15s in the middle and a word count of 72. I’m fine with triple stacks, provided that they’re handled like this—smooth crossings, and not so many 15s that the rest of the fill suffers. Not only does BEQ give us three zippy 15s (ANTISEPTIC WIPES, SEATTLE MARINERS, and *bzzzz* INCORRECT RESPONSE), but he loads the rest of the grid with Hüsker Dü’s ZEN ARCADE, NAKED NEWS (18a. [Subscription-based journalism site that bills itself as “the program with nothing to hide”]—never heard of it but I’m sure I will), I, CLAUDIUS, SAUSALITO, the U.S. TREASURY, David AXELROD, “RED, RED WINE,” INSTAGRAM, and SQUEE. This entry was posted in Daily Puzzles and tagged Brendan Emmett Quigley, C.C. Burnikel, Jim Peredo, Patrick Jordan. Bookmark the permalink. I was momentarily confused because I thought the answer to 10 down should have been the “BRO”, as stated in that Seinfeld episode. Impressive to get 6 AYS spellings into one puzzle! 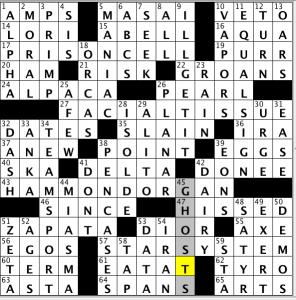 Very cleanly-filled NYT puzzle today, IMO… especially with six theme answers. Also, the partial OR TO is a nice gimme for new solvers! The BEQ was tough. The lower parts went well — smiled at I, CLAUDIUS. 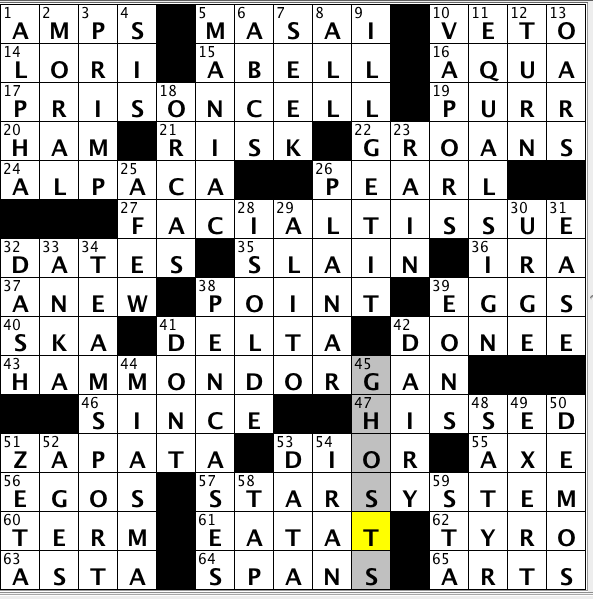 The middle was good, too, but the top took ages… And what’s the BQE highway, that SQUEE and that TWERK? Egads! This was not one of my favorite BEQ puzzles. Only one good clue (Piece provider? ), way too much trivia for me, and I also found all three long middle answers to be rather bland. I really enjoyed seeing ZEN ARCADE (one of my faves) and I CLAUDIUS, which miniseries I rewatched a couple of months ago. Man, John Hurt is creepy as Caligula. TWERK is a really in-the-moment word, referring to a particularly ugly kind of dancing Miley Cyrus was doing at the MTV Music Awards. SQUEE, to me, was the worst offense…unless somehow this is in the language too now? Tough BEQ for me–other than ZENARCADE I really wasn’t anywhere near the mindset of this puzzle. CS: The things described “build” to more complex structures: CELLs combine to form TISSUE, which form ORGANs, which comprise SYSTEMs. And SYSTEMs make up the BODY. addendum: I see you’ve speculated toward this in the body of the write-up. So, yes, that’s the intent.